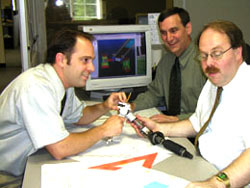 Rock Engineering is a dedicated team of talented mechanical engineers, manufacturing engineers, designers, project managers, and IT specialists skilled in the areas of product and process development, project management, Pro/ENGINEER training, Parametric Technologies Corporation software sales, consulting and data management utilizing Pro/ENGINEER. As a contract engineering service company, our staff is available for short and long-term assignments. Our mission is to deliver the finest mechanical engineering solutions for our customers utilizing technology, creativity and communication and to develop innovative designs, products, processes, and solutions that give our customers a competitive edge in their markets. Our engineering and training management staff are PTC Certified Professionals. Our training staff is certified by PTC to teach the various courses we offer. We are also one of a few select companies certified by PTC to perform Engineering Design Services using Pro/ENGINEER software.